The early morning temperatures were frigid, enough to make me want to stay in bed. Yet I knew if there was anywhere I might sense His presence, where He might see me, it would be in His house. I half-wondered if the tears would freeze on my cheeks as I drove the deserted roads alone that morning. Pulling my cape around my head and neck to block the wind, I hoped it might shield any onlookers from noticing my blotchy eyes and puffy cheeks as I skirted from the parking lot into the building. 2. God knows when you need the embrace of a friend. 3. God knows when to send a friend to fill an empty seat. 4. God knows: man makes plans but God directs our steps so we’re right where we need to be. 5. God knows when your burdens are great and you’re too weary to fight alone. At the end of the service, as they did every week, the church offered a time of prayer for anyone who needed it. If there ever was a time, this was when I needed it. My burdens were great, my pain was high, and I needed help holding up my arms as I was too weary to fight alone. 6. God knows: when you’re the one who always gives, it’s OK to receive. As I prepared to leave and head back home, my friend pulled a small package from her purse and handed it to me. “You know what it is, don’t you?” She smiled big, as I responded in kind. “I suspect I do.” I had been collecting holiday socks and sharing photos on social media, because people responded with such delight and joy, that it brought me joy to do so. I opened the package to find yet another pair of socks, this time covered in hearts. She didn’t know, but I did. You see, what no one knew but I did was that for weeks before, circumstances were grim, and in the days before, pain was excruciating and unrelenting. I was tired and oh so very weary. I had called out to God in the light of day and the dark of night. In my head, I knew He was there, but in my heart, I longed to know He saw me…that He hadn’t forgotten me. And over, and over, and over in the span of an hour, He showed me repeatedly, I see you. I love you. You aren’t alone. And you’ll get through this. God’s too good to be mistaken. And He wanted to be sure I saw HIM. Friend, I don’t know what you might be going through today, or the circumstances you are facing. 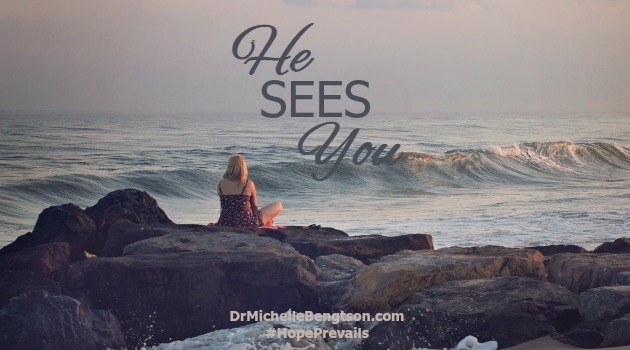 Let me encourage you that God sees YOU. He hasn’t left you. He knows right where you are, and He’s there with you, loving you and providing for you. Go to Him and let Him carry those burdens, and let Him give you rest. You speak to where we are….where I have been this past week. Sometimes circumstances can overcome us. But He is the overcomer. This morning as I sat in His presence I asked to SEE HIM in the midst of it all. Often the waves obscure my view. He helped me to see His perspective and the Truth I needed to hear. Thanks for your words today. You know where we find ourselves sometimes….and that God sees us no matter how cloudy our eyes become. Our circumstances cloud, and sometimes they even lie. They tempt us into thinking or even believing we are alone or forgotten, even by God. But if we will be honest with Him, and tell Him of our need, He is faithful every time. Lifting you up this morning, knowing that He will be faithful to meet your every need. Because of Him, #HopePrevails! Thank you, Dr. Michelle. I just posted a blog that came out of my angst this past week. You are precious to me. He not only knows our needs, but He delights in meeting them for our good and for His glory. He is good and He is faithful, and Because of Him, #HopePrevails! Thank you for your heartfelt message, Dr. B. I know He knows & understands where I am and where I’ve been for quite awhile now. Just like you and many others it has been a HUGE load, but thankfully we have the Holy Spirit who is willing to carry it for us. I have felt like my spirit is just going to “burst” out of me so much here lately. Jesus is always there and always gives us the strength and comfort as well as hope we need. I’m STRONG today because of what I’ve endured for so long. I don’t know what I’d do without the Lord. So much truth there Jo Lynn. Where would we be without Him? How do people make it without Him? He never promises we won’t have weapons come against us, but He does say they won’t prosper. He never says we won’t encounter the fire and the floods, but He does promise they won’t overtake us (although at times it feels like they might). He is faithful. 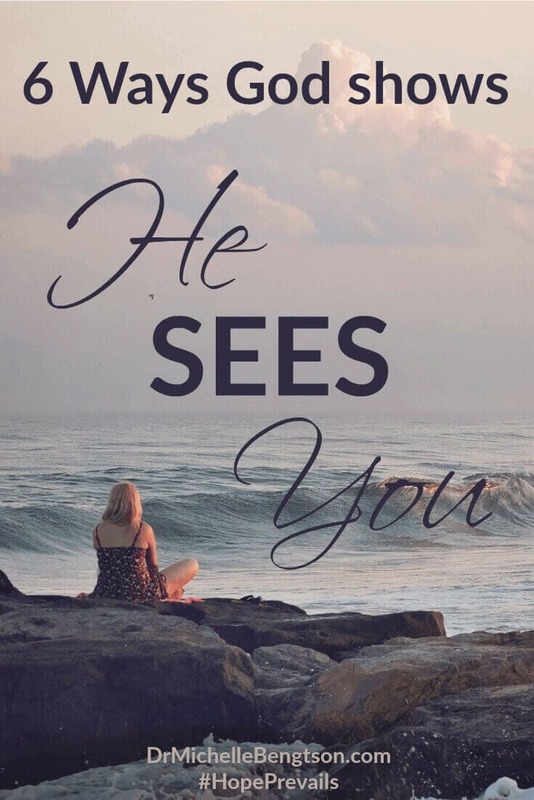 Keep your eyes on Him. Because of Him, even in the darkest days and toughest trials, #HopePrevails! What a blessing your words are this morning. Comforting, uplifting. Last week I allowed myself to become buried in the enemy’s lie of discouragement. I came to the Lord this morning asking for encouragement and He used you, in part, to answer that prayer. I love the account of Hagar’s encounter with God and her proclamation that the Lord is “the God who sees me.” How can we survive without Him? My heart sympathizes with you, as I have gone down under the enemy’s lie of discouragement before. It can be a deep well. But thankfully, His arm reaches down to wherever we are and meets us there. I’m so glad He used the words He gave me to provide you with comfort and encouragement…that brings joy to my spirit. Let there be no mistake about it, He sees you and He knows your every need and He delights in meeting them. You are a Daughter of the Most High God, and He is your Good Father! Thank you for sharing this very powerful and poignant post about El Roi. Your testimonies, proofs of the God who sees, were such an encouragement and blessing to read about. I’m glad you were encouraged and blessed. He is always working for our good and for His glory! Because of Him, #hopeprevails! Thank you for this today! You are such an inspiration and blessing to me! I myself, have had a rough past few days. Ashamed to admit, that even though I know He is here, I still wonder, and question His presence. You are a true blessing from God, and I am so thankful that He placed you in my life! My daughter has been struggling with some of the same things, and I am excited to share this with her. Isn’t it a comfort to know that we all struggle with similar things? Sometimes we just don’t know from the outside what others are dealing with. But life is hard. Life is messy. Life is full of questions. But we can take heart because He doesn’t mind us asking the questions–He wants to be our source, the I AM for everything we need. 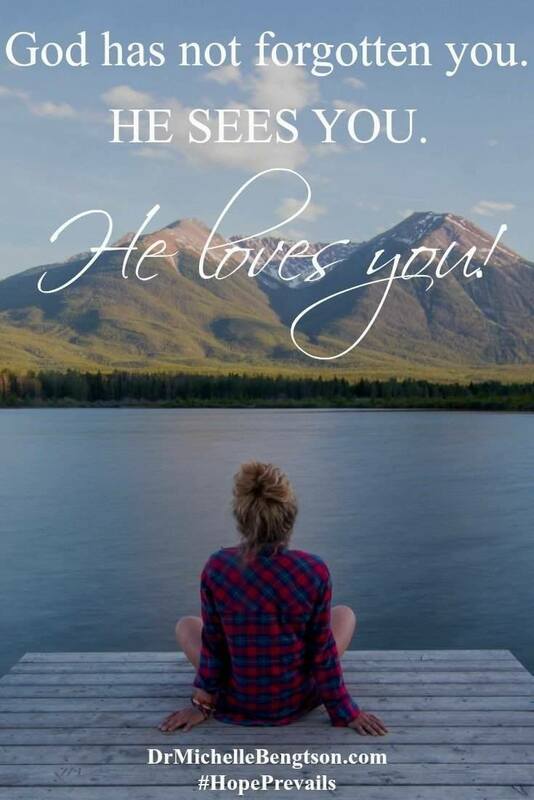 He knows you, He sees you, I’d daresay He even led you to these words today because He loves you and wanted to provide for you AND your daughter. Thankful for you and your prayers! <3 Because of Him, #HopePrevails! I’ve always been amazed how God brings us comfort in our deepest pain, when we show up with our despair, He heals, and brings friends. He is the great restorer of souls. What a beautiful, vulnerable post, than k you for opening up. It brought me back to a time I was in deep despair..early in my Christian walk. What dear new friends He brought into my life, and brought me deep healing and hope. Blessings today! From nextdoor at #smallwonder! He is so faithful to provide when we will be honest with Him about our pain. I wonder how many times we delay His provision because we delay in asking for what we need or sharing our honest hurts with Him, when the reality is, He knows already–He just wants us to initiate the conversation. Because of Him, #HopePrevails! I was in tears by the time I finished reading this. I have been there, too. In fact, over the course of my life I have been there many times. And He is so very faithful. He does see us, doesn’t He? What do people do without Him? I truly don’t know how people do it who don’t know Him. Many times in my life, when I was just barely hanging on, HE was the only thing I was hanging on to. There have been many times I have just needed to know that He knew my heart, knew my needs, and saw me, not the me that everyone else sees, but the me in need of Him. He is so faithful. And I’m so grateful. Because of Him, #HopePrevails! Thanks for sharing your story. I love how God showed you in so many ways that he loves you and you were not forgotten. It’s encouraging to remember that he knows exactly what we need and he wants to carry our burdens. His plans are unique for each of us, just as our needs are unique, and His expression of His love for each of us is unique. But He is perfect in all of His ways. Because of Him, #HopePrevails! You didn’t know, but I did…that I needed this beautiful post. I told God I really needed some encouragement — and there you were, right before me on Strangers and Pilgrims. I’ll remember these words and carry them with me this week. That brings tears to my eyes! How wonderful is He to allow my words to comfort you, using the comfort He gave me. Such a good God we serve. Delight in the fact that He sees YOU and He heard your cries. Because of Him, #HopePrevails! What a tender story of our God’s gentle and personal care. Thank you so much for sharing. What an encouragement! Thank you for these timely words. They brought me to tears, so close to home they are. Beautiful example of the yoke of rest that Jesus offers — and when He uses His servants to bring us His love . . . what a joyous thing it is! Thanks for sharing this very tender story of a need met by a a caring Christ and a friend who heard His voice about your need. Michelle, you’ve spoken the words my heart needed to hear today. You cannot imagine how much. Words of peace and comfort and hope. Thank you for being His faithful servant. Wishing you blessings, my friend. Because of Him, #HopePrevails and I’m so glad it does. Oh, what a beautiful post! Thank you for sharing your testimony so others know God is always, always with us and works through others to show Himself to us! Dearest Dr. Michelle, it amazes me how you can touch the hearts and lives of so many with your kind and honest ways. You only know my through my blog and I only know you through your website yet your posts always hit home….as if you wrote them just for me 🙂 I know others have the same thought and it’s only because of the Lord. The way He words and leads is truly astounding! Thank you for faithfully linking up with Roses of Inspiration. Your articles ALWAYS bless my heart. Hugs and joy to you! What it is – is what I needed to read; what I needed to know! That He DOES see me! That He DOES know exactly what I am going through and what I need…and right now, this evening, what I needed was to read your words! Thank you so much…I am sharing this post on my blog and pray someone else who needs to hear this will find it as well.